Hello to another edition of our plant based stories! This fun series of posts is intended to introduce you to other vegan/plant based bloggers to learn more about how and why they transitioned to veganism. My hope is that you might resonate with one of these stories and be inspired yourself to live with not only more intention but maybe even consider a vegan lifestyle yourself! Plus these talented bloggers share one of their favorite bowl recipes with us! It’s important to support each other on our plant based journey; which is why you will see throughout the interviews that each blogger talks about practical tips – from traveling to what they put in their grocery cart! Let’s dive in, meet Valerie and learn why she adopted a vegan lifestyle. Hi Val! Thank-you for being part of our Plant Based Stories series, can you tell our readers a little about yourself? My name is Valerie, but my friends call me Val and I live in the Boston area. 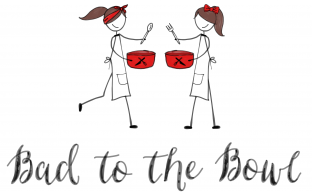 I used to work as a research scientist, but I have recently devoted myself full-time to what I’m passionate about – vegan food. I have a blog, Very Vegan Val, where I share my love of food, veganism, and adventurous, compassionate eating. I often like to explore foraging and using unusual, wild ingredients – my blog is a perfect outlet where I can share these experiences. Have you always been vegan? I have been a vegetarian for as long as I can remember. I decided at the age of 5 that eating chickens was wrong, and I wasn’t going to eat animals anymore. It took almost 20 years, though, for me to take the next step to veganism! I had sort of known that eating dairy products and eggs was not as ethical as I liked to think it was. While I hoped that my milk came from happy cows, and my eggs were laid by foraging, adventurous, happy chickens, deep down in my heart I knew that wasn’t true. After college, I had a lot of time on my hands. Like many college students facing graduation, I found myself without a job and nothing to do but apply, apply, apply…and think about my food choices. It was then I decided to give up dairy and eggs, motivated by my long held beliefs in animal welfare. I stopped buying any animal products, and continued using my cheese and mayonnaise until it ran out. I’ve been vegan for about 4 years since that point. Wow! I can just imagine you at 5, saying to Mom at Dinner, NO More Chicken! How did your family respond? Were they supportive? My family has always been very supportive of my choices- after all, my parents were the ones who allowed a five year old to choose their own diet! When I became vegan, I was an adult, and dove into cooking and exploring plant-based cuisine. My parents cheerfully ate all the veggie dishes I cooked up, and they also modified holidays like Thanksgiving and Christmas so I would feel included. I think that is amazing! More parents should be mindful to explore different lifestyles with their children. As we know, ‘animal products’ are necessary for that protein portion of the balanced plate. Is your significant other plant based supportive and / or vegan too? My partner (who was a meat eater when we met) always ate vegan food with me, even when we went out to restaurants, so that I could try whatever he was eating as well as my own dish. He quickly avowed that he wouldn’t eat any more meat unless he knew the conditions it was raised in. A few months into our dating, we watched “Cowspiracy” together, and he has been vegan ever since. That is great! Many people experience health benefits when they transition to a plant based diet. Did you notice any health benefits? I never really got into veganism for health, but nevertheless I received health benefits! Not huge and dramatic differences, and it should be noted that my becoming vegan was only a change in eggs and dairy (as I was already vegetarian). There were little differences though – such as my hair has gotten thicker and grows much faster than it used to. I used to sometimes get stomachaches after eating, and feel uncomfortably full for an hour or so, which is something that doesn’t really happen anymore. The funny thing is, I never thought of it as weird or unusual that eating (a normal thing we all have to do) would cause me pain. I also have people close to me that have noticed dramatic changes since becoming vegan. My partner used to suffer from acid reflux after most meals, to the point where it was a daily occurrence. He would pop an antacid and move on. In the three or so years since becoming vegan, the number of times he has gotten acid reflux can be counted on one hand. Another friend of mine used to suffer from menstrual cramps and a period that lasted 10 or more days. It meant that literally 1/3 of her life was spent in discomfort or pain. Since becoming vegan, that time has become much more tolerable, and cut in half. What motivates you to stay 100% plant based? A desire to live an ethical life. I believe that veganism and a plant-based diet are best for animals, the environment, our bodies, and solving issues of food insecurity, and I feel obligued to do my part. Plus I love unique food experiences and sharing my foraging experiences on my blog – vegan food can be very adventurous! That is so cool on the foraging! Are there any favorite ‘bowl’ recipes that you can share with us that might includes some of your foraging fun? Yes! 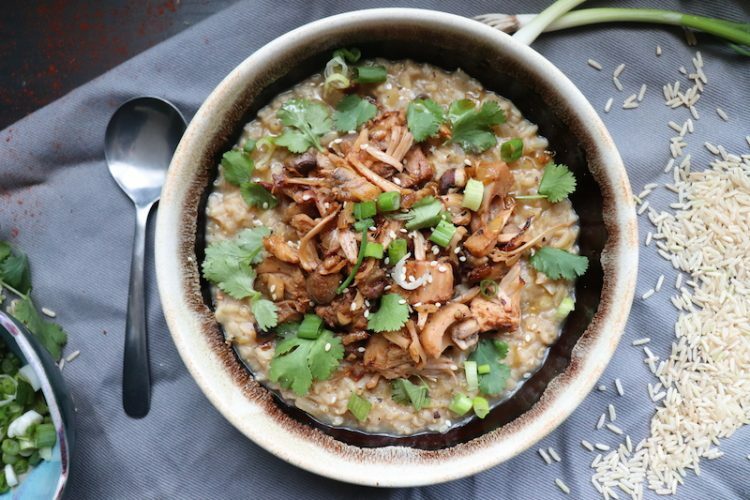 This is not exactly ‘foraging’ but does have a mushroom topping and I have been enjoying this comforting dish alot lately – Vegan Brown Rice Congee (Savory Rice Porridge) with Jackfruit and Mushrooms. That sounds delicious! I don’t think I have ever made savory rice porridge, I need to try this pronto. With your sense of adventure do you find it hard to travel / go out to eat and stick to a vegan diet? I am super lucky in the sense that most of my friends are either vegan, or willing to go to a vegan restaurant with me. My best friend when eating out is the Happy Cow, a great website for finding places in the area that are entirely vegan, or at least have vegan options. 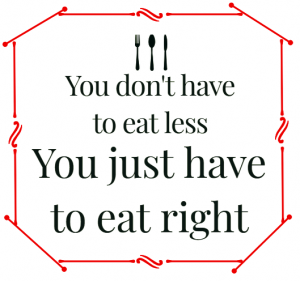 It’s always easier going out to eat if you’re able to do your research ahead of time, and know what you can have on the menu- online resources such as the Happy Cow are a great tool, but you can also always call the restaurant ahead of time and ask what vegans options they have. Do you feel that most people would benefit from a vegan diet? I believe that anybody can benefit from a plant-based diet, as long as they are mindful of getting the right nutrients. Plant-based diets are shown to reduce a lot of diseases (such as heart disease, diabetes, high blood pressure, and some types of cancer). These are diseases that are increasingly common in our population, and diet is a great way to reduce your risk before you need to start taking medications. I agree with you! I am always interested in what other vegans are filling their carts up with at the store. Do you mind giving us a peak inside your cart? Lots of fresh produce is always my number one priority. Add some beans and grains, and you’re good to go! And your favorite vegan food? Vegan Pizza – of course with my Simple Buckwheat Pizza Dough! Any other words of wisdom is to share with our readers? Remember that a plant-based or vegan lifestyle is a goal- it’s okay to take it slowly, just make sure you’re pushing yourself to eat more vegetables and try new vegan recipes. Think about new and creative foods you can eat, rather than concentrating on the meats and dairy you’re no longer eating. Great advice! As the saying goes ‘Rome wasn’t built in a day” . Where else can our readers connect with you? Thanks so much Val for sharing your plant based story with us! I look forward to checking out your creative recipes at Very Vegan Val!